Apex® tooling products are manufactured to exact tolerances that often exceed licensing agreement requirements, standing up to rigorous government/military specifications. These tolerances greatly increase the durability and life of the tool. An Apex® bit can last up to ten-times longer than competitive bits. The closer tolerances of Apex® tools, also mean a better fit and less cam-out or stripping, which in turn keeps work areas free of damage and reduces incidence of bit failure and costly re-work. Browse thousands of Apex® tools including screwdriver bits, bit holders, hand drivers, nutsetters, extensions, universal wrenches, sockets, extensions, adapters, universal wrenches, special sockets, accessories and more. 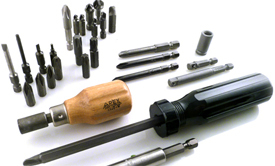 Apex® screwdriver bits from Cooper Tools. Apex® bit holders from Cooper Tools. Apex® hand drivers from Cooper Tools. Apex® square drive adapters from Cooper Tools. Apex® square drive extensions from Cooper Tools. Apex® nutsetters, extensions, universal wrenches from Cooper Tools. Apex® sockets, extensions, adapters, universal wrenches from Cooper Tools. Apex® special sockets, adapters, accessories from Cooper Tools. Apex® square drive universal wrenches from Cooper Tools. The Apex WSK Wobble Socket Adapter Kit can convert any fastener tool with a female square drive (3/8'', 1/2', 5/8'', 3/4'' or 1'') and a DIN groove into a Wobble socket.